Your assignment is to make a color wheel with primary, secondary, tertiary colors and blech. The wheel should fit on 14" x 14" Bristol and should include the drawn triangles. As with the grey scales, you should use Bristol chips about 1 1/4" square for your wheel rather than painting directly on the board. Glue them to the board with a dot of glue. You can really only tell the color of each chip in relationship to the others (color relativity). You can do this all at once, or work on it a few related chips at a time. Be sure to keep your water and your brush clean! Muddy water makes muddy colors. 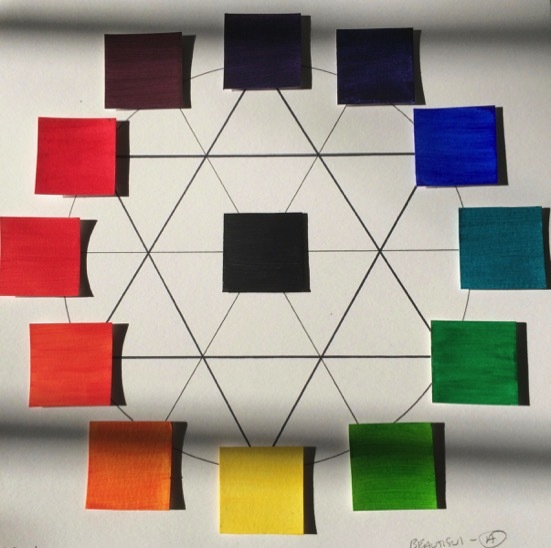 Below is an example of an actual student's color wheel assignment. I took this photo under afternoon sunlight; the colors still are not exact, but they're pretty good. The red-violet needs to be a bit more violet and the yellow-green needs more yellow but, the colors are clear and not muddy and the layout is exactly as assigned. Overall, this is a very well executed project.